As they bake, cracks develop, exposing their fudgy interior - Treat Santa with the best cookies this Christmas! Silly season brings a lot to the table… quite literally; turkey, brussel sprouts, and roast potatoes fill platters on Dec 25th. But with savoury comes sweet, of course, and these moreish delights would be nothing without their sugary counterpart, the Christmas cookie. As it turns out, the Christmas cookie existed long before Santa Claus and fairy light laden Christmas trees. The delicious custom is rooted in the Pagan Solstice celebration, which historically marked the changing of the seasons. Solstice celebrations were centered around food; the remnants of the Autumn bounty were feasted upon in preparation for the barren Winter. Meats and wines dominated their celebratory meals, and their more primitive version of the festive treat made the perfect après. Fast forward to the Middle Ages and Christmas cookies have gained a lot more sophistication. The arrival of spices like cinnamon, nutmeg and ginger revolutionised the medieval larder. The expense of importing such exotic ingredients meant cookies were reserved for special times of year only. The Christmas cookie we enjoy today dates back to these medieval times. Perhaps the most iconic of all Christmas cookies, the Gingerbread man, hails from the UK. The edible mascot is said to have regal roots - Queen Elizabeth I of England pioneered figural baking when she had her favourite cookie molded into the shapes of her best courtiers. Going east, Germany and Austria have long been known for their pastry proficiency. With cookies like Lebkuchen, Zimtsterne and Linzer cookies to their name... they certainly know their way around a cookie cutter. Lebkuchen is a softer variation of the famed gingerbread cookie. Typically topped with a citrus glaze or chocolate sheath, these gingerbread don’t mess around. Zimtsterne are easily described as a less fussy approach to an almond macaroon. Star shaped and accidentally dairy and gluten free, these cookies are a millennial delight. The younger, more versatile cousin of the Linzer tart, the Linzer cookie consists traditionally of two almond cookies bound using a blackcurrant jam. Here in the Nutritics office, our Christmas cookies almost always involve chocolate. This year we’ve gone for something a bit less traditional than the medieval gingerbread. 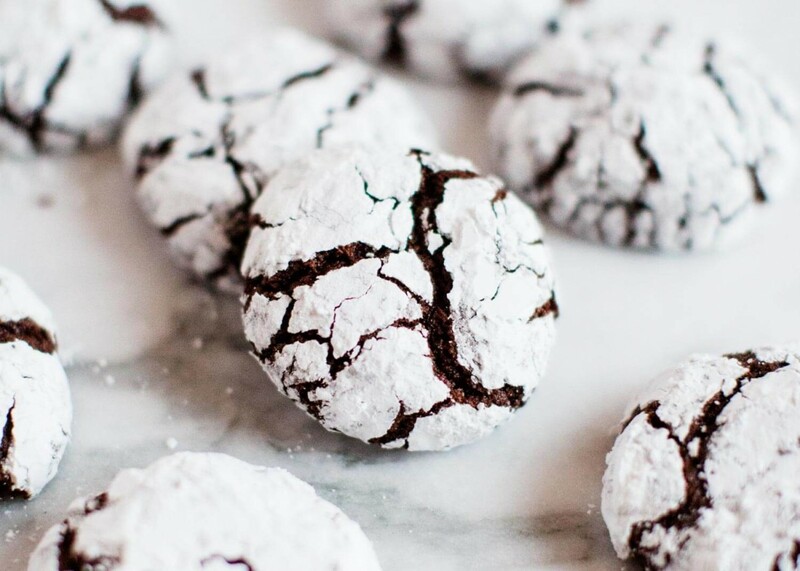 Since December hit, we’ve been munching on the beautifully simple chocolate crinkle cookie; a classic chocolate cookie wrapped in a layer of icing sugar. As they bake, cracks develop, exposing their fudgy interior. Christmas is a time for indulging. Energy balls and green smoothies cast aside as cheese, wine and chocolate move in. A quick bit of Nutritics analysis tells us theses cookies are miraculously only 78 kcal a pop! Take some time out from your hectic festive schedule to give your very own crinkle cookies a go. In a medium mixing bowl, combine sugar, cacao, and vegetable oil. Beat eggs in one at a time, then add vanilla. In a separate mixing bowl, combine the remaining dry ingredients, then stir into the egg mixture. Cover the dough and chill in refrigerator for a minimum of 4 hours. Preheat oven to 180℃. Line cookie sheets with parchment paper. Roll dough into one inch balls. Coat each ball in icing sugar and transfer to prepared baking tray. Bake for 10-12 minutes. Let stand on baking tray for 2 minutes, then transfer to cooling rack. For a more accurate nutritional breakdown and costings, have a look at the recipe here.